I am a big gym goer although my consistency these last few years has been anything but impressive. As much as I love all the options and classes that the gym has to offer the truth is, sometimes I just can’t make it there in a day. When that happens I like knowing that I have some options at home to fall back on. Going through the process of downsizing, living a more minimalism style life and getting in gear with our finances has made me very aware of the importance of exercise outside of the gym. The truth is, gym memberships can be expensive and not doable for every house hold. 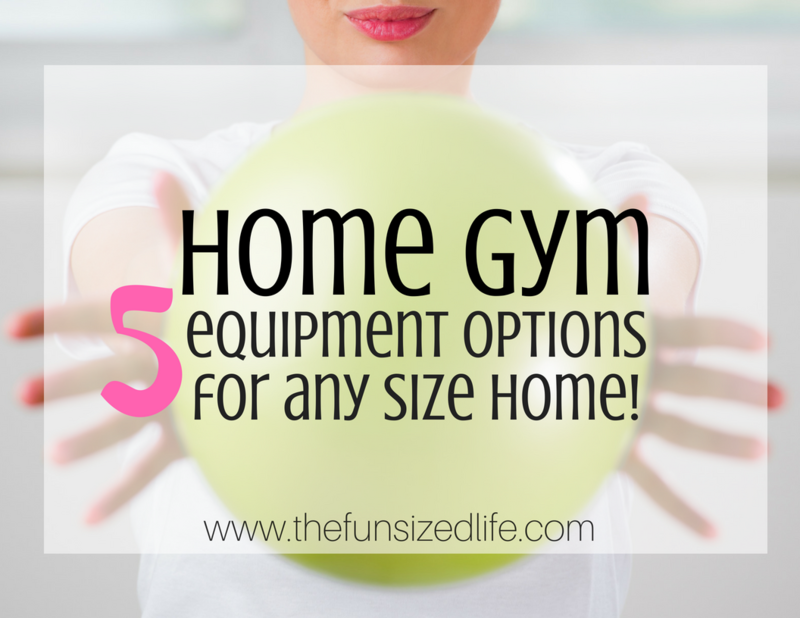 At the same time, not every household has a spare room with ample space for a treadmill and weights. That’s why I cam up with the perfect home gym for any size house. Kettlebells are all the rage these days. There are more and more gyms offering classes on how to use them and they are becoming more and more common to have in the home. I myself have had my set for over 8 years now before they were the “in” thing. I have a simple set of 15, 10 and 5 pounds that are easy to use and fit right under my bed. At the time of purchase, mine came with a handy guide on how to use them plus a DVD with guided instructions. Now you can find workouts all over Pinterest as well as on YouTube. Here is a great one to get you started. I went through all the best options I could find on Amazon and compiled some of the highest quality kettle bells for the most reasonable price because starting your home gym definitely shouldn’t have to break the bank! Like I said, especially if you are just starting out, I’d recommend going small with the 5,10,15 pound kettle bell set. If you are an experienced kettlebell user and you know you’re in this for the long haul, Amazon also has a few options that are a little bit on the bigger side but at a very reasonable price. These bands have to be my favorite new find in equipment. Not only are they crazy portable, but they offer resistance workouts in a whole new variety of ways. I originally saw them in the workout videos of YouTube sensation Jen Heward. That girl has got glutes for days, so I will happily listen to whatever she tells me to. She also has a ton of gym workouts and at home workouts, but for today, I found a great full body band loop workout that is quick and to the point. The greatest thing with these Resistance Loop Bands is that they can literally be taken anywhere. This is great if you travel for work or just travel for pleasure. If you want to keep up with your fitness, these bands are totally carry-on friendly. On top of that, they are also incredibly reasonably priced. I browsed around for a variety, but really there is no way to go wrong and most packs are right around the $10 range. Yeah, I went there. While a yoga mat doesn’t offer the same weight or resistance training as kettle bells or loop bands, yoga brings a whole new type of workout. The benefits of yoga can strengthen and lengthen your muscles. Beyond muscles, it can also put so much in your mind at ease. Beginning or ending an at home workout with yoga is a great way to calm your mind and get some clarity before pushing your muscles. When it comes to an at home workout, the first person I turn to is Yoga with Adriene. She has a huge variety of yoga workouts ranging from beginner to weight loss and even more advanced. I chose one of my personal favorites to share with you guys. Another great thing about yoga mats is that you can use them to accommodate your yoga style. You can use the mats for more than just yoga. They can be a great padding for floor workouts including things like pilates. If you have a more sensitive back a thicker mat is a great way to accomplish a lot of your workouts without any discomfort. Personally, I prefer a thinner mat because the flat hard floor helps me achieve better balance and a thin mat doesn’t get in my way. I got a variety of options together for you guys depending on your personal style. My stability ball was my absolute life saver during pregnancy. My lower back ached like crazy and the ball helped me avoid putting pressure on it. Plus, having a big belly it wasn’t exactly easy trying to keep up with my ab workouts. Even 6 years after having my last baby, my stability ball is still a must have in my house. There is so much that you can do with only a ball during a workout or just during day to day life. More and more people are beginning to use stability balls just to sit at their desk. Using them this way can really help with core and lower back strength. Because I personally loved having this ball during pregnancy, I found a great workout for pregnancy below and if you are interested in a faster recovery after pregnancy, check out my post, Post Partum Quick Recovery. I forgot to mention, stability balls also can come weighted! This is extra great for one of my favorite ab workouts. This quick photo is from Active.com. Here are some of the different varieties that they have to offer on Amazon, some with kids, some weighted down and a variety of sizes. Yes, I’m corny, I know. But, there is so much truth behind this. There are so many ways you can use your body to get your workout in. Whether it’s swimming, hiking, dancing or yard work your body is capable of so much. If you still can’t get outside or into a pool, that’s when you check out some of the awesome body only workouts like dancing, tabata and hiit. Check out some of these awesome body only workouts. Naturally, I’ll keep em short and sweet. All it really takes to keep a clear space and a healthy, fit body is to make sure to get out and get moving. Never underestimate the power of a nice, long walk. That’s part of the minimalist movement anyway, right? Living intentionally and living with less so you can get out and move more. At least that’s what it is for me. Hope you guys found some helpful equipment suggestions!